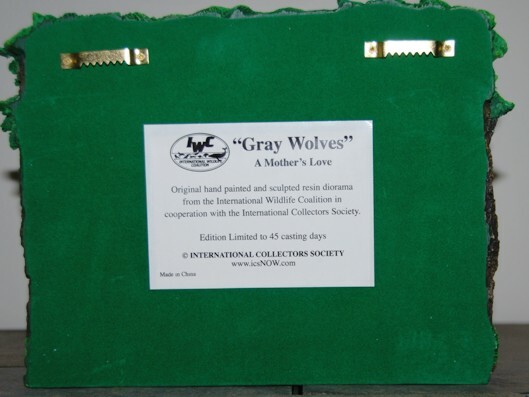 This beautiful Gray Wolf Diorama is called A Mother's Love. It features a Mama Wolf playing with her two Pups in a pine forest setting. This is an original piece from the International wildlife coalition in cooperation with the International Collectors Society. It is a limited edition piece with 45 casting days. It is hand painted and fashioned out of resin. The back and bottom is lined with green felt. It could be stood up or hung. There are two hangers on the back.